It's so beautiful. Like edible art. Mmmm, I love roasted veggies. This combination sounds really tasty. Lovely. Have a great week. Roasted veggies and a standard at my house. The more variety, such as in your dish, the better. Glad that your family enjoyed them. My sons love roasted vegetables and your look so colorful and pretty. That's beautiful. I love roasted vegetables but mine don't come out that colorful. I'll have to try radishes! Beautiful colors and variety! I've been wanting to roast veggies for awhile and now you've inspired me. Will pass on the radishes, though :). Looks good! I love roasted sweet potatoes - one inch cubes, drench in apple cider, throw in a couple of small lemons cut into halves, an onion sliced like you would for a curry, and plenty of garlic cloves, toss with some paprika and cumin - and it is so good. I bet these would be good too. There's just something about roasting. 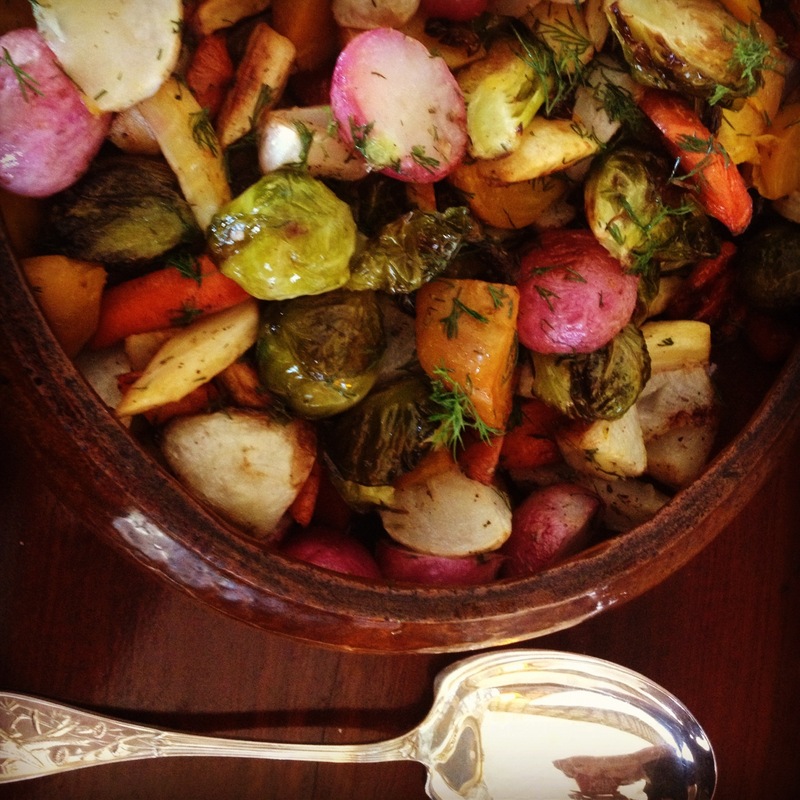 I adore roasted veggies. We had roasted Brussels sprouts just this week. Aren't they beautiful? I may have to try your version for Christmas. I love root vegetables, especially beets. This sounds so good and so easy. Thanks for posting the recipe. I love roasted vegetables. Yours look so pretty, so colorful! I'll have to try your recipe. That looks so beautiful. And delicious. This looks so frickin good. I'm going to have to do this. Wow, that looks delicious! I only recently discovered roasting veggies (other than potatoes) and am loving it. I hadn't thought of doing such a big mixture of different ones but will definitely try it!